Summer is finally here. School is out. I am off for two whole months! Today is Canada Day - a day when we celebrate the creation of this amazing country we are so lucky to live in. A country my parents fled to, one that gave us freedom and opportunity. Our family will paint the town red to celebrate this afternoon. But it wouldn't be Canada Day without some good ol'fashioned Canadian love. Style at Home has rounded up some amazing Canadian designers to share their favourite spaces, one of them if a local gal and friend, Karla Amadatsu and her photographer Tracey Ayton. So many drool and Pin worthy spaces! Be sure to check it out - and be amazed at the Canadian talent we have. Like I need an excuse to go pinning ;) Thanks! Happy Canada Day Barbara and enjoy your 2 months off! Happy Canada Day to you! Happy Canada Day B! I feel honored to work alongside our Karla Amadatsu. She is one talented girl! Super happy for you, you so deserve this time off. Yes, Karla is a talented woman and Tracy works so well with her. Yeah for BC talent. Saw some of your instagram pics - looks like you had a perfect Canada Day! I don't know about you Barbara but somehow I am more tired now that summer vacation has started... Or maybe my end of the year exhaustion was masked by stuffing report cards, gluing together kindie scrapbooks, and taking year end field trips in the pouring rain:) enjoy your summer!! Oh I missed this! Thanks for the link! There sure are a lot of talented artists/designers in Canada. Hope you enjoy your summer! Have a great time off work Barbara - enjoy! 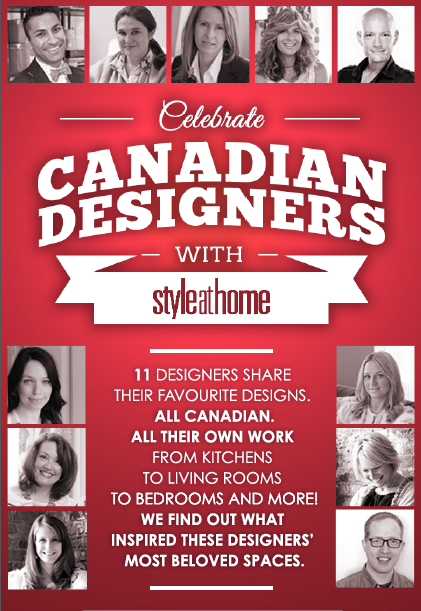 I've read that amazing article on Canadian designers, very impressive and thanks for the link! Have a great Canada day, and thanks for the link!